Airtel is out again with a new double data 2018 plan called "Airtel Small Money, Big Data". This cheap Airtel data plan is available to new Airtel subscribers on Smartconnect tariff plan. • Airtel 500 Naira recharge gives 1.5GB instead of 750MB. • Airtel 1000 Naira recharge gives 3GB instead of 1.5GB. • Airtel 1500 Naira recharge gives 7GB instead of 3.5GB. • Airtel 2500 Naira recharge gives 11GB instars of 5.5GB. 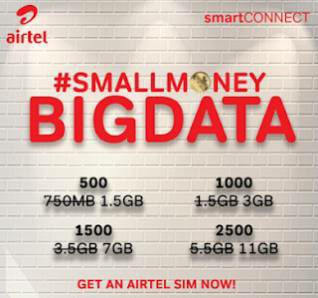 To be eligible on Airtel Big Data Small Money promo, get a new Airtel SIM and register it. After the registration, you sim will be automatically Configured for double data on Smartconnect promo. This promo will give you Airtel Double data for 6 months. If you see 1000 Naira for 3GB , then congratulations because you are eligible. But if you see 1000 for 1.5GB, it means your Airtel line is not eligible for this double data offer. All you have to do to enjoy it is to walk into any Airtel care center and buy a new Airtel SIM. Then choose any airtel data plan of your choice, you will see the data are already double the original data Airtel allocates. please how long does this Airtel data plan lasts,the Airtel double data. and do they charge excessively on Airtel 1000 for 3GB?